I still haven't read Days of Blood and Starlight even though I bought it the day it came out. Horrible of me! So I'm actually not looking at the synopsis I'm posting below. Still, I'm excited about the idea of Dreams of Gods and Monsters. Dreams starts where Days left off, with Karou and Akiva discovering each other alive — although Karou is still not ready to forgive Akiva for killing the only family she’s ever known. And now, through an act of staggering deception, Karou has taken control of the chimaera rebellion and is intent on steering its course away from dead-end vengeance. When Jael’s brutal angel army trespasses into the human world, Karou and Akiva must ally their enemy armies against the threat. It is a twisted version of their long-ago dream, and they begin to hope that it might forge a way forward for their people. And, perhaps, for themselves – maybe even toward love. But there are bigger threats than Jael in the offing. From the streets of Rome to the caves of the Kirin and beyond, humans, chimaera, and seraphim will fight, strive, love, and die in an epic theater that transcends good and evil, right and wrong, friend and enemy. I didn't even know this book had a title yet.. I am sooo excited! Yes!!! I am so excited about this. I, too, still need to read Days of Blood and Starlight. Wow, thanks for sharing this with us. I definitely need to read Days of Blood soon! OMGosh, yes. This is definitely on the top of my list!! AHHHHHHHHHHHHH! I NEED THIS BOOK ALISON! Though I've forgotten a lot of what happened in Days, so I probably should re-read that before April:) Hope you get a chance to pick it up soon, it was awesome! I still haven't read the first one, but I'm making m book club read it to make up for it! It sounds SO GOOD! I still need to read the second book in this series, but I really enjoyed the first book! I´m dying to read this book! great pick. I'm going to have to try out this series again. The first book I didn't like as much. Nice! Haven't read this series myself but see it around quite a bit! Hope you enjoy this one! As well as the previous one! I seem to be always just 1 book behind in fave series myself! Cool(: I've seen this around...must. read. Lol. Haha you and me are in the same boat. I preordered Days of Blood and Starlight but it's still waiting for me to read it so I didn't read the synopsis above :P.
I have no clue how this book is going to wrap up the series. I'm definitely scared and excited! I cannot wait for this one! 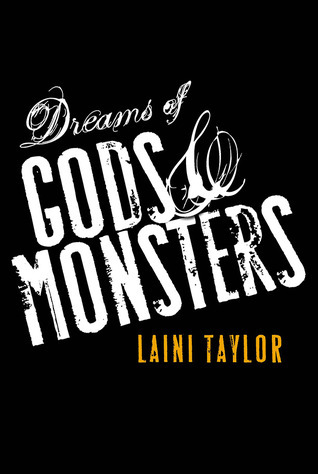 I love Laini Taylor's books SO MUCH! I need to read the second book too so I didn't read the summary either. If the first book had blue accents and the second had red, does that mean the third will have orange, green, yellow, or purple accents? I feel like it will be one of those colors and I'm excited to see what it looks like.